Who needs takeout when you can have a steamy bowl of ramen on your table in no time? 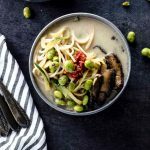 Our super simple vegan coconut miso ramen recipe is ready in less than 30 minutes. No muss no fuss!